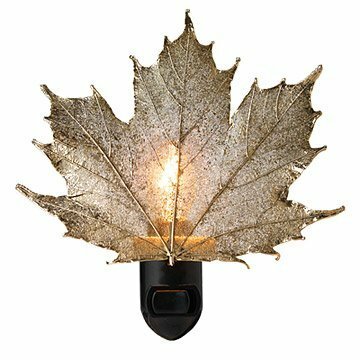 This gorgeous night light is made from a real Sugar Maple leaf and preserved in 24 karat antique gold. Finally, a night light that you won't need to hide during the day. This gorgeous night light is made from a real Sugar Maple leaf and preserved in 24 karat antique gold, so it retains its delicate outline and tiny pores and veins just like in nature. During the day, this night light will be a stunning gold and ethereal accent to your home. When turned on at night, the soft golden light will serve as a guide in the darkness without sacrificing aesthetics. Now you have something to look forward when you get up in the middle of the night. Handmade in California. Takes a 120 V 4 watt bulb, included. First, I'd like to say how impressed I am with Uncommon Goods. Unfortunately, that's where the praise ends. I depend on other reviews to help me make a purchase, so I feel obligated to give this info to others. In the picture, this nightlight looks classy, natural, a subtle bronze. Instead, I got a BRIGHT gold leaf. It looked like someone took a leaf and saturated it with the brightest gold paint around. The result being it looks like solid cheap metal, or gold plastic. Yes, you can see light through it, but not a look I'd want to have when off. Just to be fair, I called and they sent a replacement thinking this was just a "fluke," but the next one was exactly the same. I was SO looking forward to what I saw in the picture. What came wasn't even close. This was to be a gift, and it looked so cheap I'd be embarrassed to give it as I wouldn't have it in my own home. Decorative lighting, no problems with it. It is virtually impossible to find an appropriate way to acknowledge someone's loss of a loved one. Honestly, this lovely nightlight is now something that my friend says reminds her of the "light that her mom is in the heavens". Even though this time the light was given as a memorial, it could be given to anyone for any reason where you want to create a gentle memory or reminder. A very pretty and unique gift. Love this product so much I bought another as house gift! The night light is made well. It is beautiful! I ordered another for a family member because she loved it so much as well. If using for a lighted hallway for children this would not work. I like that it's not so bright but reflects the gold leaf and perfect Fall decor! So unique! Great gift for those Halloween decorators or tree huggers! Please follow me on IG and Pin! ShoppingTutor for all great women's fashion and home decorating inspiration! I got this for my mom for a Mother's Day gift. It adds detail and interest to a room. It's a lovely idea for a night light! My sister lives in a log home and loves nature. This is the perfect nightlight for those nighttime trips to the bathroom. Excellent construction. I have to be careful or my daughter might steal it!